15 years ago, while still living with my parents, I brought home a little white toy poodle. The second I saw her I knew I had to take her home with me. It probably would have been best to get permission to bring home a dog, but I took the risk. After about 10 minutes with her my whole family agreed that she belonged with us. Miller was so full of life. She loved to go for car rides. Anything with water made her happy. She used to find the plants that my mom recently watered and play with the run off water until she managed to splash it all out on the floor. Her favorite thing though was playing ball. She could play ball all day. We never even taught her, she just did it. She would bring the ball back and drop it right in front of you. If you told her “I can’t reach it” she would get it and move it closer or even put it in your lap. If you still did not throw it for her she would bark at you until you did. I used to come home from work and she would great me by dropping the ball down the stairs as I was coming in and up. Miller was one of kind. Everyone that knew her loved her. Even people that don’t like dogs could not help but love Miller. When Miller was about 5 I started working a lot and felt that she was not getting enough attention. After thinking long and hard I knew the best thing I could do would be to give her to my mom. My mom always loved Miller. She had more time than I did and I knew Miller would get the love and attention that she deserved. It was sad, and I missed her like crazy but I knew I made the right decision. Over the past 10 years my mom and Miller have been inseparable. Miller was less like my mom’s dog and more like her side kick or little furry shadow. My mom took Miller sailing with her often. 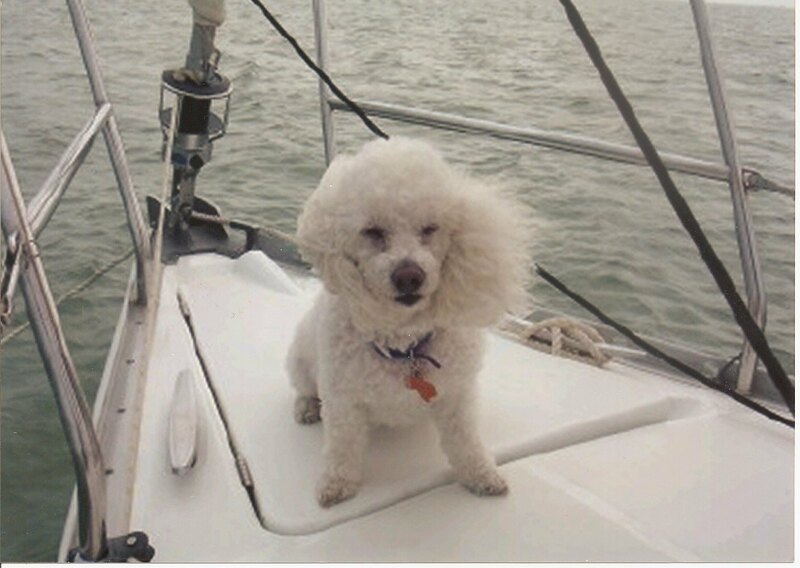 Some of Miller’s favorite times were spent on the boat with my mom. She even had her own little life jacket for rough waters. My entire family has loved Miller since she joined us 15 years ago. She was so much more than a dog to all of us. There will never be another Miller. Today Miller went in for dental surgery. She made it through the surgery, but passed away earlier this evening. She went quick and did not suffer. My mom was with her so she was not alone. We will all miss Miller very much. I can’t imagine life with out her. The 15 years she was here with us will always be treasured. Miller, we will never forget you. You will be with us always. I hope you are somewhere playing ball now. Good bye, Miller. Thanks for all of the wonderful memories.